Brenda and Duane met in 1978, only a few miles from where they currently live. They married in 1983 and Marin was born in April of 1992. The 26-acre property was purchased in 1993 and we called it the Black Diamond Ranch. The driveway to the house is so steep, that if it ever snowed in Lockwood, the driveway would be a black diamond ski run. In 1999, the Wolgamotts entered into the wine growing business. after talking to several grape growing experts they knew, Syrah was becoming a popular varietal and that is what they planted. The original plan was to just grow and sell wine grapes. Marin still remembers pulling out the many and large calcerous rocks when the vineyard site was being developed. The first crazy idea was planting a vineyard, and the second was to start our own winery. Our first harvest was in 2001. 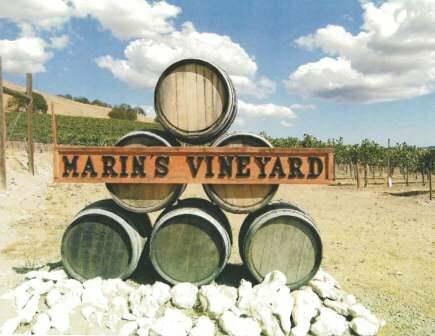 Then in 2002 we started our own label and brand - Marin's Vineyard. Marin graduated from California Polytechnic State University, San Luis Obispo in 2014 with a degree in Wine and Viticulture concentrating in Enology. She has worked for many prestigious wineries in the Central Coast area - Chamisal Vineyards, Clesi, Tooth and Nail Winery, and then in Oregon with Boedecker Cellars, then down to the Yarra Valley in Australia. Sensory analysis and chemical analytics of wine has been her specialty. Besides her day job as assistant winemaker with Joel Gott Wines, she is currently the head winemaker for Marin's Vineyard and helping to lead the sales and marketing. Winemaking is her passion and that's evident when you hear her talk about wine. Brenda is a General Manager for The Wine Group and oversees 3,00 acres of vineyards in Monterey County. She's been a viticulturist for over 20 years and is a well-respected professional in the grape growing industry. One of Brenda's favorite hobbies is to ride her horse, Stylish Contessa, and compete at cutting horse competitions. Duane retired this year from being a Chief Business Official. He has worked for several school districts in the area, primarily in the area of facilities manangement / construction and fiscal / business operations. You can find Duane some weekends working the tasting room and he will tell you all about Marin. (There are a lot of pictures on the walls to help him). Although we are small, we believe that we can make an impact. We strive to make hand-crafted wines that reflect our grass roots and ranching heritage.